Kraftwerk fans have been left frustrated as massive demand for tickets to the group's forthcoming residency at London's Tate Modern crashed the website. The iconic electronic act will perform eight live shows at the Tate Modern's Turbine Hall in London next year, with each night seeing the band perform a different album from their back catalogue. However, many fans were unable to purchase tickets after the surge of traffic to the Tate Modern's website caused the site to crash immediately at the 7.30am onsale time. A phone line was offered as an alternative though that too could not cope with the strain. Fans attempting to buy the £60 tickets met with a message reading: "Kraftwerk at Tate Modern has just gone on sale and we are experiencing a phenomenal demand for tickets which is affecting our web server. Please try to buy tickets online again later, or call 020 7887 4919 to join the telephone ticketing queue. We have extra staff on hand today but demand is extremely high. We apologise for any inconvenience this may cause you, and hope you are successful in getting your tickets." Tickets are reportedly still available. A tweet from Tate at 11.26am read: "Please keep trying +44 020 7887 4919, if you receive an engaged tone then please redial until you are placed in a queue." Many fans took to Twitter to voice their frustration. Scroll down the page to see an assortment of tweets. 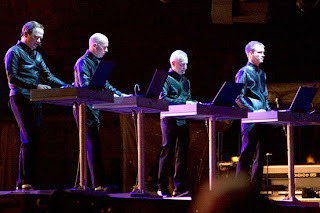 The Kraftwerk gigs, which are called '1 2 3 4 5 6 7 8', will take on the same format as the run of dates they played at New York’s Museum Of Modern Art in April of this year, and the shows they have confirmed to take place in their hometown of Dusseldorf next January.